Review: Field Of Vision–Family Movie Night! You are here: Home / Great Deals / Review: Field Of Vision–Family Movie Night! I just got to preview a new movie: “Field Of Vision”, sponsored by Walmart & P&G! It’s a feel good, magical family movie that left me crying – a good cry! I would recommend it very highly! As you may already know, P&G and Wal-Mart have partnered to create more made for TV family movies. Following in the success of the most recent film Truth Be Told, the newest P&G and Wal-Mart Family Movie Night collaboration Field of Vision premieres June 11th at 8/7c on NBC. Through mysterious footage captured on an old malfunctioning video camera, Sinclair High School’s star quarterback, Tyler McFarland, learns that some of his teammates have been bullying Cory Walker, a troubled new transfer student. Aware that sharing this information with the coach might get his friends kicked off the team and ultimately cost the school the state championship, Tyler must choose what’s more important: winning or doing what’s right. You can see the premiere of “Field Of Vision” Saturday, June 11 on NBC at 8pm ET/7pm CT! You can learn more about the movie by going to the official Family Movie Night website and check out the Family Movie Night Facebook page, too! 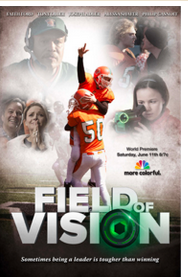 Don’t for get to watch the premiere of “Field Of Vision” Saturday, June 11 on NBC at 8pm ET/7pm CT!